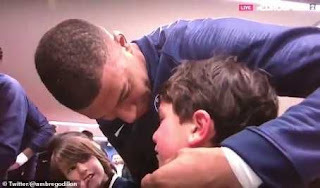 Kylian Mbappe helped a young mascot overcome his emotions as he prepared to walk out with the Paris Saint-Germain Squad from the tunnel. The fan is at the front of a line of mascots and is due to walk out with PSG captain Thiago Silva for the semi-final. 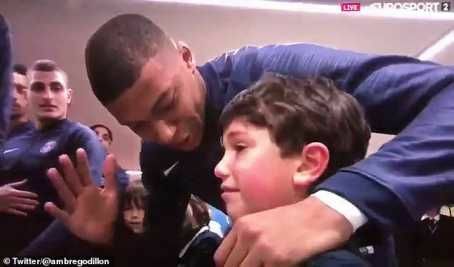 Mbappe soon spots the emotional youngster and feels compelled to step into put a smile back on his face. He has a brief conversation with the star struck mascot before giving him a high-five and a kiss on his right cheek. The young fan soon steadies himself for theoccasion before taking Silva's hand and wearing a wide grin as they emerge from the tunnel at the Parc des Princes.